Updated on 5 September 2014. Buvaisar Hamidovich Saitiev, also spelled Buvaysar Hamidovich Saytiev, (Russian: Бувайсар Хамидович Сайтиев, Chechen: Сайт КIант Бувайса) (born March 11, 1975 in Khasavyurt, Dagestan ASSR) is a Russian wrestler of Chechen heritage, who has won nine world-level gold medals in freestyle wrestling. He is widely considered the greatest freestyle wrestler of all time. He currently is an acting State Duma Deputy from Dagestan. In 1992, Buvaisar left his hometown of Khasavyurt, Dagestan in order to train at a prestigious wrestling center in Krasnoyarsk, Siberia. Soon after graduating from the training center, Saitiev began his quest to represent Russia on the world stage. Buvaisar has been decorated with the Order of Friendship by the Russian president. His younger brother Adam Saitiev, also a wrestler, won gold in the 2000 Summer Olympics in Sydney. And not - to deafen and eclipse. To be on everybody's lips! 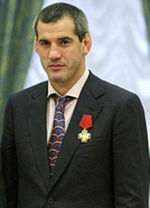 Saitiev has won nine world-level gold medals. He is a six-time world champion and a three-time Olympic champion. His senior-level international career began in 1994 and, to date, has continued on through the 2008 Olympics in Beijing, China. In thirteen years, he's entered eleven world championship tournaments, won nine world championship tournaments, and lost only two bouts. ^ "Olympics-Russian wrestler Saitiev abandons comeback attempt". Reuters. 21 April 2012. Retrieved 9 August 2016. ^ R, Coach Mike (27 June 2014). "The greatest wrestler ever, Buvaisar Saitiev, flattens a toddler". SB Nation. Retrieved 9 August 2016. ^ Wyman, Patrick. "Why Are UFC Champions Hanging Out With An Accused Russian War Criminal?". Deadspin. Retrieved 9 August 2016. ^ Рамзан vs Сагид. Почему Абдулатипов провел в Думу Бувайсара, но сломал карьеру Сажида? This page was last edited on 22 January 2019, at 12:58 (UTC).